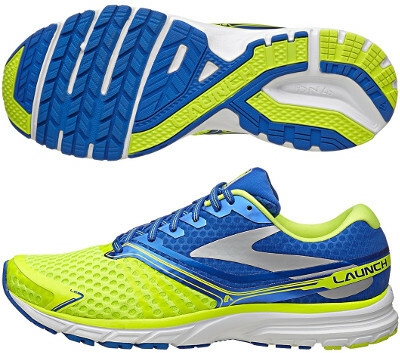 Brooks Launch 2 are neutral performance running shoes. The Brooks Launch 2 is the new version of the popular performance neutral shoe from Seattle's brand. Although it belongs to the same category as its 5 years old predecessor the Launch, current version is a completely new shoe that provides perfect blend of cushioning and lightness to feature great response for daily workouts and tempo runs. Also suitable for long runs and half/full marathon racing. The Launch 2 takes advantage of latest technologies from Brooks already used in popular models like the Ravenna 6: flexible and durable outsole and adaptive BioMoGo DNA cushioning in the midsole. Heel strikers enjoys extra support thanks to segmented crash pad for smooth transitions. The upper follows current trend and it is made of unstructured breathable mesh in the forefoot and a structured heel counter to secure the foot. Both heel collar and tongue are plenty of padding and in combination with wider forefoot's toe box make it a really comfortable shoe. It provides good support for medium/high arc.